The DataCal Konkani language keyboard labels are a high-quality, durable and economical solution to creating a Konkani bilingual keyboard. The Sanskrit / Konkani Labels conform to the keyboard layout in Windows XP. 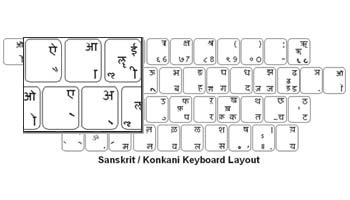 These labels support the keyboard layout for: Sanskrit/ Konkani. This language is supported in Windows Vista also. The Labels are an economical option for a bilingual Sanskrit / Konkani keyboard. The language labels will not damage the original keyboard key. The letters are printed on the underside of the labels so that the lettering will not wear off. This affords you with many years of durable use. DataCal language labels are designed to fit desktop and laptop computer keyboards.Laptops with smaller than standard keys may not be compatible with the DataCallabel sets.